How well do you sleep? I sometimes have the problem of waking up really early in the morning, like around 4am, when it’s just getting light, or needing to sleep in the day if I have a bad headache. I think it happens when I haven’t been crocheting enough! Since I chopped off all my hair I realised it would be more feasible to wear an eye mask. Previously, the prospect of adding something else around my head to get tangled in the night was enough to keep me awake, which sort of defeats the point! So, I thought I’d use up some scrap fabric and left over bias binding making some masks. Having made one, I’ve done another for my husband, since we have upcoming long haul flights. I think these would make good gifts for new mums too! 60cm bias binding (more or less depending on your template size) – make your own if you like! Start by sketching out a template on a piece of paper and cut it out and check it against your face. I made two templates as the mask for my husband needed to be bit wider and have a deeper nose notch – he has a more architecturally interesting profile than I do! Now, you will need to cut two of these from the cotton fabric and one from the felt. I cheated and folded my fabric to save a seam like this – so mine was just one piece for the front and back. It you have a printed fabric with a direction on it you’ll need to cut your front and back separately. Sandwich the felt between the cotton pieces and stitch around close to the edge to secure it all. We’ll use the bias to cover these stitches later so don’t worry about being neat! Then attach the elastic to one side by stitching backwards and forwards over it several times. I found the best place to attach the elastic is with the bottom of it level to the top of the nose notch. The lower it is the better at cutting down on light coming in around the nose area, but too low and the elastic will be on your ears. Check how it fits as you probably won’t need all the elastic depending on how stretchy yours is and the size of your head. Pin and stitch on the second side. Open the bias binding and pin around one side of the mask, with right sides of fabric facing. You may need to make tiny folds around the nose notch. Stitch into place. Now, because the felt is quite bulky, check that the stitching is all covered when you fold the bias around and over to the other side. If not, trim away some excess mask edge, being careful not to cut the unstitched bias binding. Fold over the bias binding and pin and stitch into place. 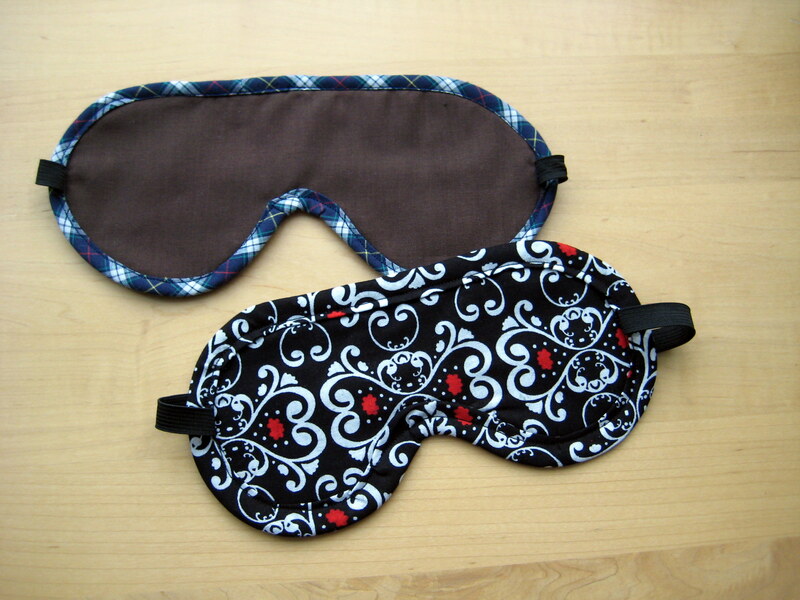 Now enjoy a restful night’s sleep!